Kathleen Guthrie (nee Maltby) was a painter in oil and opaque watercolour, silkscreen printer, textile designer and mural painter. She also wrote children’s books. She was born in Feltham, Middlesex and educated at St Michael’s Hall, Hove. She studied art at the Slade School from 1921 to 1923, under Henry Tonks and at the Royal Academy Schools from 1923 to 1926. She married the artist Robin Guthrie in 1927 but later divorced and then in 1941 she married Cecil Stephenson the constructivist painter. She was influenced by Stanley Spencer’s “The Nativity”, and also by the French Impressionists and her husband’s more conventional Augustus John-like style but later moved from pictures with a whimsical, poetic feeling towards pure abstracts. In 1931 she went for two years to Boston with Robin Guthrie where he was invited with Rodney Burn to become a co-director of the School of Fine Art. In 1932 Kathleen Guthrie had a solo show of figure paintings and landscapes at the Stace Horne Gallery, Boston. When she married Stephenson and mixed with the avant-garde of Hampstead her style changed again. In 1948 she produced a mural for a local welfare centre and in 1951 Wolf Mankowitz’s Little Gallery held a solo show of her work at the Crane Gallery in Manchester. She also exhibited at the Royal Academy, the Royal Society of British Artists, Goupil Gallery, the New English Art Club and the London Group. In 1966 a retrospective exhibition was held at Drian Galler. She illustrated several children’s books including “The Magic Button” and “Magic Button on the Moon” which contain short poems by her. 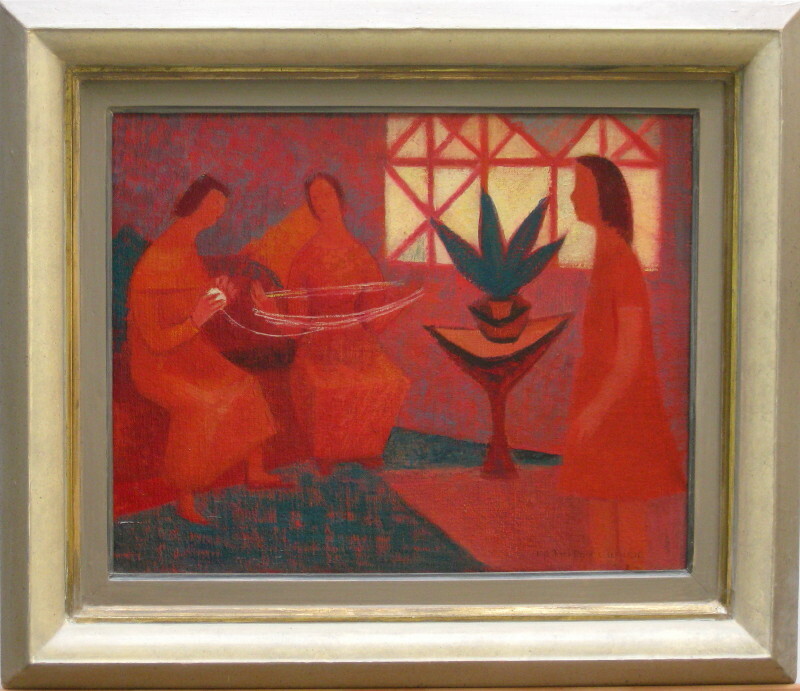 In 1941 a painting by Kathleen Guthrie was purchased by the Government. She has also had her work reproduced in “The Studio” magazine. She lived in London.